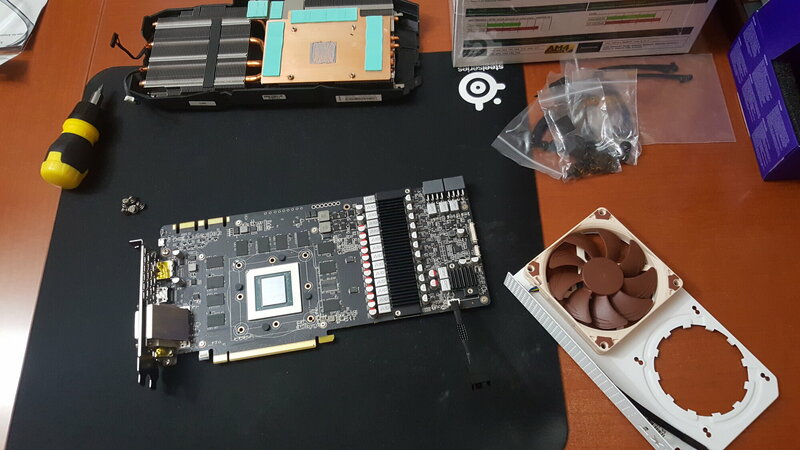 Discussion in 'nVidia Flavor' started by kasakka, Dec 23, 2018. I'm thinking of picking up a 2080 Ti if their prices drop or I can find a used one in my country in the next 3 months. However, depending on the model air coolers can noisy. I have a NZXT Kraken G10 bracket and a Corsair H55 AIO cooler left over from my previous 980 Ti setup and I enjoyed how quiet it was while keeping temps in check. Do you think that setup would be enough to cool the 2080 Ti or would I need a bigger radiator? A 90mm fan on the bracket would be used to cool VRM and VRAM. I don't care about getting extra overclock over air cooling but just keeping it quiet at load. 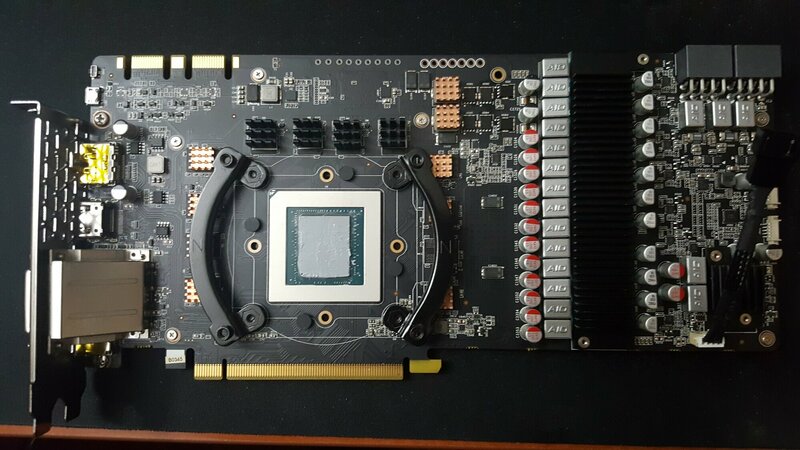 How much hotter do you think a 2080 Ti is than a 1080 Ti? I hope to finish my 1080 Ti + G12 + H55 combo this weekend. I'll post back with results. Please do, interested in that as well since at this rate a used 1080 Ti might be a more sensible option. I’d go full water block if you’re going that route. I would be careful with a kraken because there’s VRMs all over the card. Also make sure you can RMA it if necessary. The base TDP is the same as a 1080ti. So far, max temp running Unigine Heaven at 1440p with tessellation maxed and 8x AA, is 54C with power limit set to 120, core speed +65, and core voltage +50, but it hovers around 52-53C looped. This is with a Noctua AF 12x25 on the H55 and a Noctua AF 92mm on the G12. I also added all kinds of heatsinks on the VRMs. That gets me 2050 MHz on the core at 50C and below, 2037 MHz above 50C. The H55 is set up as an intake. The fan is running at almost 2000 RPM on the H55. Not too loud really. I'm measuring the backplate with a thermometer to gauge the VRM temps and they are slightly lower than the stock heatsink at the same settings. revenant, Armenius and kasakka like this. I would prefer to avoid that as I already have a spare G10 + H55 from the 980 Ti I sold earlier this year. I've had a custom loop before and getting new water blocks for GPUs was getting expensive so I went back to air since air coolers at the time had gotten a lot better than when I started water cooling. So, I had another Noctua NF-A12x25 that I got for Christmas. Adding that to make the H55 push-pull kept the temps at 49C running Unigine Heaven. However, it must have grazed 50C at some point because the clocks dropped to 2037 and stayed there. So, $60 worth of fans on an H55 nets you great results ;-). I guess if I could have found another Asetek AIO with a thicker radiator, maybe I could have gotten maybe a couple degrees lower and kept 2050? I was a little disappointed in the benchmark results versus stock. Only a couple of fps better on average. Also do you have any shots of what the Stock Cooler TEMPs were ? I've been meaning to put this stuff up on here. Hopefully, I'll have time this weekend. I have the temps I was getting with the air cooler written down. I'll post everything I have when I do it. 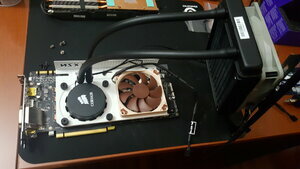 I do know that the 1080 Armor is a good donor because the air cooler is not so good. I've done something similar but I'm using a H90 for some larger fans to keep the noise down a little more. I did the NZXT G12 bracket and Corsair H55 v2 setup with my Zotac 1080Ti AMP edition, which comes with a heatspreader on the VRMs stock. OC'd to 2025MHz core / 5800MHz mem. Temps stay under 65c at 1440p x 165Hz with ultra quality settings. The radiator fan is a Noctua Redux NF-P12 (120mm) and a Noctua NF-A9x14 (92mm) on the bracket. I used heatsinks on the memory and whatever other components had thermal tape on them for the stock HSF. Artic MX-4 thermal paste on the die. This card had a "fan freeze" feature which turns the fans off when the card isn't being loaded, which was inconvenient due to the VRMs not having the thermal mass of the stock HSF on them, so I used Zotac Firestorm to disable that. Once that feature was off, I was able to use a converter cable from the video card fan header into normal PWM fan connectors, so the video card controls both the VRM fan and radiator fan (or rather, I do with a custom fan curve in MSI Afterburner). To the poster saying they weren't getting the performance they were expecting... run Furmark/Kombustor and try lowering your core clock while watching the FPS meter. There are some odd clock rates that actually cause a frame rate decrease despite being numerically higher. revenant and SticKx911 like this. I'm curious if anyone has run with a larger AIO radiator for temp comparisons? It's hard to find anyone using more than a 120mm with a video card. I can't find the post off the top of my head, but I did talk with someone here using one and they were keeping temps in the 40s and staying at 2050 or above with a 1080Ti I believe. I may be upgrading to a 240 radiator asetek cooler soon to see for myself. 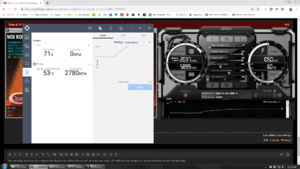 I ran a H90 on a GTX970 didnt see over 55c at stock. So I went through the trouble of installing a 240mm NZXT Kraken X52 in place of the 120mm Corsair H55 v2 that was there. I used Noctua NF-P12 120MM 1700RPM Redux fans for both radiators in an exhaust pull config. These are static pressure fans, both the CPU and GPU heat are exhausted directly out of the case. Curiously, the NZXT X52 temp spikes immediately to 50c, then flattens out and climbs very slowly to its max. The Corsair H55 heats up slowly and climbs steadily to max. 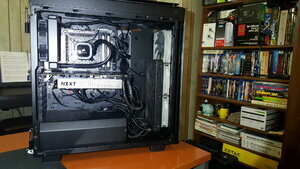 Final thoughts: The Corsair H55 was a cleaner install, fewer wires, no need for SATA power, shorter tubes. The temps were fine but required a 90% fan speed to maintain under 70c. 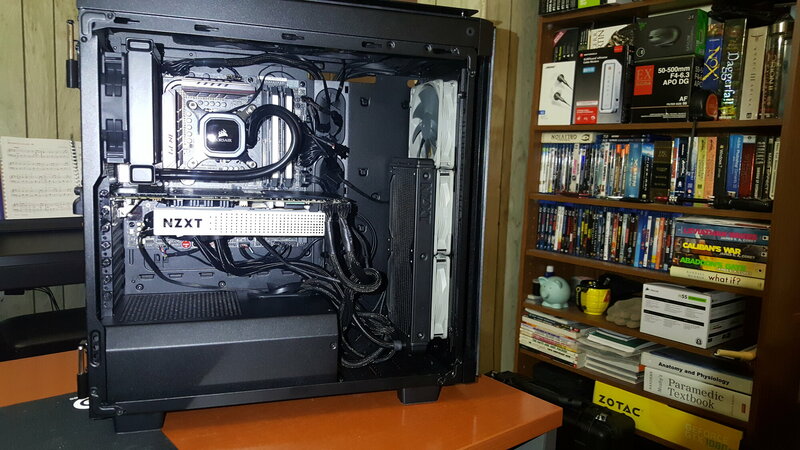 The NZXT X52 is harder to keep tidy due to USB, SATA, and a 4-way fan splitter, along with longer tubes... BUT the temps are substantially better and they stay at 60c at 70% fan speed. Was the upgrade worth it? YES. Edit: installed the NZXT cam software and changed the pump profile from silent to performance which fixed the temp spike and lowered max temps by 5c. Post has been edited to reflect the new numbers.